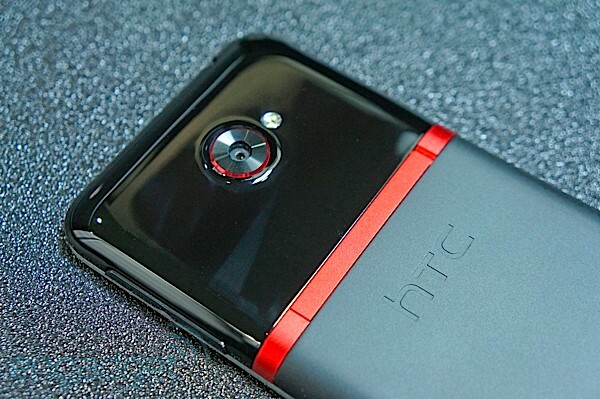 HTC is on a roll in the US, first releasing the One S for T-Mobile and the One X for AT&T. Now, with the EVO 4G LTE on Sprint, it's ready to shift to the CDMA realm in a different costume. Internally, it's incredibly close to what's offered in the One series' flagship, but the Now Network has made a few tweaks to the device so it'll adjust to life as the latest smartphone in the fabled EVO lineup. This time it's packing a powerful processor, gorgeous display and the ability to connect to the still-dormant LTE. It's eager to show its face in retail stores beginning May 18th for $200, placing it in the high end of Sprint's selection. This review, however, is just a bit different from any we've done before. How so? To our knowledge, we've never done one in New Orleans before. But when a phone gets dropped in our lap at CTIA 2012, we're naturally going to put it through its paces, regardless of location. As it shares so many commonalities with its One brethren, we've been expecting a very similar fit, feel and performance. In our review, we'll take you through what's different and what's better or worse. Is this the best device to grace the hands of Sprint customers? Follow us past the break to find out. The EVO 4G LTE is an excellent option for Sprint users interested in the latest and greatest, but it's marred by the network's frustrating limitations. To say this is a One device is a disservice; while it closely resembles a One in size and internal specs, there are several factors that contribute to our impressions of the device being completely different than HTC's trio of international Sense 4-clad superstars. No doubt due to the Taiwanese company's insistence at keeping its new brand intact without much interference from the notorious influence of US carriers, we're thankful that the EVO 4G LTE doesn't have any association with the One brand. At first glimpse, it's easy to tell why Sprint actually attached the EVO brand to this device -- it simply looks like a natural follow-up to the EVO 4G, a phone that was announced at CTIA two years ago. 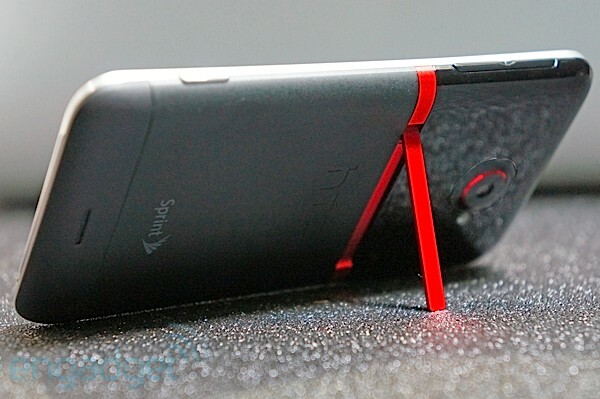 While there are many reasons this handset is easily associated with one of Sprint's greatest-known brands (the kickstand comes to mind, but more on that shortly), the most recognizable bit is its color scheme, offering a delicate balance of dark greys and reds on the rear of the device. Fortunately, there's just enough red for it to complement the rest of the phone without being too in-your-face. 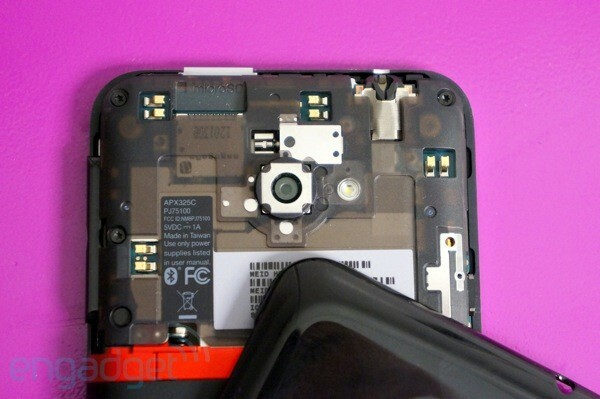 If you had to compare the EVO 4G LTE with any of HTC's other phones, it'd be closest to the AT&T One X without a question. It stays true to several specs, such as the sensationally beautiful 720p S-LCD2 4.7-inch display (for a pixel density of 312ppi), 1.5GHz dual-core Qualcomm MSM8960 Krait SoC, 1GB of RAM, LTE compatibility, 8MP ImageSense rear camera and 1.3MP front-facing shooter. However, it adds a few tempting improvements: its 16GB internal storage space is now friends with a built-in microSD slot, beefing your maximum capacity up to 48GB. The phone's battery is also larger at 2,000mAh, versus 1,800mAh on both versions of the One X. Finally, Sprint's model is graced with HD Voice, a feature that's expected to become a staple on more devices in the Now Network's lineup. There are also very modest variations in size and weight. At 4.73 ounces (134g), it's just a tad heavier than the other two. It also measures 134.8 x 68.9 x 8.9 mm (5.31 x 2.71 x 0.35 inches), which makes it shorter by one millimeter and wider than the international One X by four-tenths of a millimeter. Its thickness remains exactly the same as its brethren, however. Of course, unless you're staring at all three devices side-by-side for long periods of time, it's quite likely that you won't notice any sort of difference at all. And to its credit, we found it to be just as comfortable to keep cradled in our average-sized hands for long durations, much like the other two models we've been judging the EVO 4G LTE against. Since it's designed to be an EVO instead of a One, its overall appearance is the clearest departure. We touched briefly upon the phone's color scheme, but there are some other stark differences to go along with it, such as the materials. We're actually quite pleased with the ingredients here, we'd just prefer not to see all of them thrown in at the same time. In contrast to the smooth and uninterrupted polycarbonate plastic build used on the One X, the EVO 4G LTE uses a red kickstand to divide its back into two sections. On top you still get a polycarbonate body that, despite its highly durable feel, is one of the worst offenders of fingerprints known to mankind. Moving to the bottom, you'll find an anodized aluminum setup with a smooth matte texture that reminds us of the micro-arc oxidation on the back of the One S. A machined-aluminum band races around the handset's edges. Now, let's not dance around the kickstand. As minor a feature it may seem, it was a major talking point for the EVO 4G when it was first released in 2010. The metal piece is something we typically only see in HTC devices -- it was also added to the Thunderbolt's chassis last year. Oddly enough, it's as if the kickstand only shows up in inaugural next-gen phones: the EVO 4G was the first WiMAX device, the Thunderbolt was the first LTE smartphone on Verizon and this time it's making an appearance in the first HTC LTE handset on Sprint's network. We're happy to report that the kickstand feels completely polished in use, and we have full confidence that this little gizmo will hold the weight of the phone without any hassle. It even works in two directions for good measure. Why does this matter? It means you can charge the phone while it's propped up. Above the EVO's massive screen, there's a short strip of anodized aluminum -- the same material gracing the bottom of the phone's rear -- with a recessed, front-facing camera and LED notification light sitting underneath a speaker grille. The choice of grille over the One X's individual machine-drilled holes makes for another cosmetic difference that leaves us slightly disappointed, but the design preference doesn't adversely affect the phone's sound quality. Drifting south brings us to the display. While it's every bit as beautiful and vibrant as the S-LCD2 panel on the EVO 4G LTE's older brother, the glass doesn't drape over to the edge. We prefer the seamless look of the One X as the panel just appears to curve over each side. Instead, the top of the phone ekes down along the outer boundaries of the phone to act as a barrier between the screen and the aluminum band that flanks it on the left and right. Finally, the bottom of the display bears a set of three capacitive keys, featuring back, home and multitasking buttons. Shifting our focus to the edges, we see a microUSB charging port on the left and a 3.5mm jack on top alongside the power button and one of two mics. The right side of the phone sports a volume button and -- joy of joys -- a camera shutter button. Despite our love for this fancy hardware feature, we don't see it in as many phones anymore. Sadly, this includes every device in the One series. 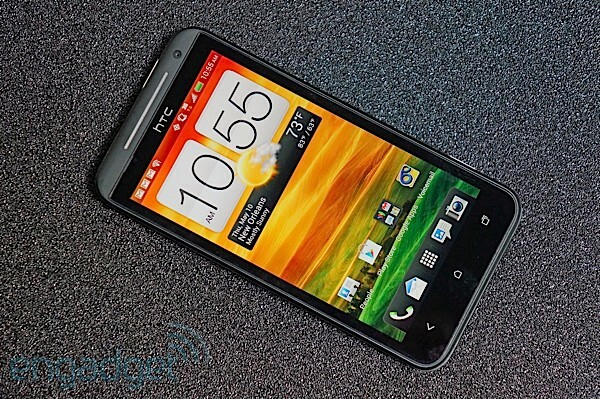 We're definitely applauding Sprint and HTC for making sure it was included in the EVO 4G LTE. We already discussed the mish-mash of materials lining the back of the phone, but let's dive a little deeper. 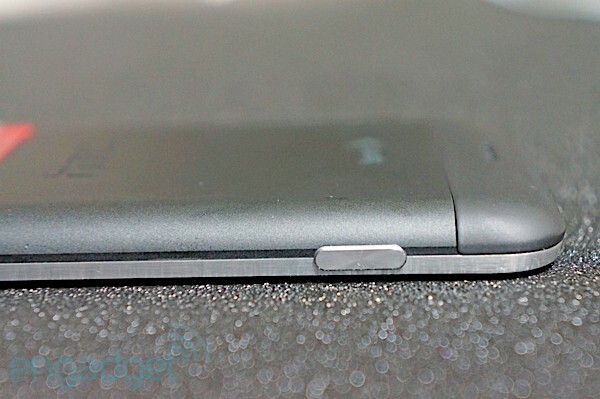 The plastic top doubles as a removable cover, opening up to reveal the highly revered microSD slot. To our disappointment, the SIM is embedded within the device and cannot be removed. From what we've been told, the only way to reach the SIM is to tear the phone apart. Unsurprisingly, the battery suffers from the same fate. The 8MP BSI f/2.0 camera -- the same one you'll find on both versions of the One X and One S -- sits in this section as well. To our delight, the 28mm lens is recessed underneath the cover, which means you'd have to try pretty hard to dirty it up. As the name implies, this iteration of EVO is indeed capable of hitting LTE speeds, utilizing Sprint's 1,900MHz spectrum -- in theory, at least. There's just one simple yet significant catch. Despite the fact that this phone will be available in stores on May 18th, the LTE switch hasn't been flipped to the "on" position. We're told that it's still on track to arrive this summer, but don't expect to take advantage of the super-fast speeds to satisfy your lust for unlimited data just yet. CDMA is all you get in the meantime -- WiMAX isn't even an option to hold you over. For now, the phone's name is just a bunch of empty acronyms writing checks Sprint can't cash. Also, world travelers won't be remotely happy with their experience on the EVO 4G LTE, as the phone lacks the GSM and HSPA+ support necessary for international roaming in nearly every corner of the globe. One other notable difference to the EVO 4G LTE over its One-branded relatives will only be found when you plug the device into your computer. While the One X and S offer options to use USB mass storage or MTP to transfer files, your choices are cut in half with Sprint's version -- MTP is all you have. Just like any Ice Cream Sandwich device, however, you can still opt for mass storage functionality through your microSD card. Sprint's newest flagship follows in the exact footsteps of its similarly specced predecessor, offering up more of the same all around near-excellence. 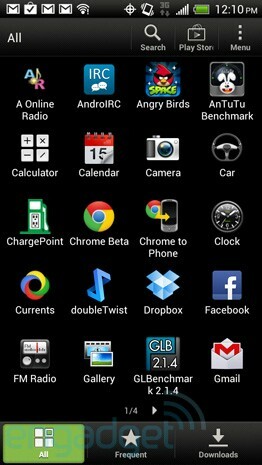 Navigation through the seven customizable homescreens is predictably fast and responsive. It's hard to find much fault with the finesse of the EVO 4G LTE's user experience. Unfortunately, that briskness falls prey to occasional hiccups, as we noticed when the screen froze during an attempt to access the settings menu. We were able to get the device to eventually respond, but those moments of broken fluidity are not exactly few and far between. Tradition typically dictates a devolution for carrier-branded devices; an unholy fall from their purebred OEM graces resulting in a user experience fettered with the software hiccups most closely associated with third-party intervention. Thankfully, however, the EVO 4G LTE has largely avoided that terrible fate, falling in line, more or less, with the benchmark performance notched by AT&T's variant. Its Quadrant, Linpack and NenaMark (1 and 2) scores bizarrely fell short of both the One X and One S, despite sharing a similar Snapdragon S4 processor. The handset did, however, leap past its cousins with a SunSpider score of 1,649 and for good reason too, as full desktop pages rendered in under five seconds with occasional tiling. Caveat: Sprint's yet to officially flip the switch on its nascent LTE network, so we have no precise way of knowing the true longevity of the device's 2,000mAh battery when stressed by those 1,900Mhz waves. In the meantime, we were able to test the operator's 3G performance in New Orleans and, surprisingly, it yielded speeds that far exceeded the slow CDMA crawl we're used to seeing elsewhere. Whether that's a direct result of a dearth of iPhones in the area, the EVO 4G LTE notched a max of 2.4MBps down and averaged 1.7Mbps / 731Kbps. We'll also dynamically update our review as we continue our tests on network speed, battery life and overall call quality with HD Voice, so stay tuned. Update: We finally put the EVO 4G LTE through our usual battery rundown test (looping a video with brightness and volume set to 50%, Bluetooth disabled, WiFi turned on but not connected and CDMA plus LTE enabled) and the phone lasted eight hours and 55 minutes, just like AT&T's One X -- this despite a larger 2000mAh battery (vs. 1800mAh on its cousin) and a strong CDMA signal. The difference is likely due to the LTE radio being enabled without a network available. We were unable to test HD Voice because the feature is not expected to start rolling out on Sprint's network until "late 2012," according to a spokesperson. Regular calls, however, sounded clear on both ends and reception was problem free. What's left to say about the software on a phone so nice, HTC's released it thrice? Not much, it turns out, especially where carrier customization is concerned. Sprint's managed to keep that count down to two, with only Zone and Hotspot taking up space in the app drawer. This is, after all, the cream of Peter Chou's smartphone crop and, as such, comes lightly bedecked in a Sense 4 suit, underneath which lies Google's latest dessert-themed UI (4.0.3) replete with the usual GApps, including Google Wallet. Members of the tech-savvy tribe should, at this point, be unfazed by this heretical skinned approach to Android 4.0 and either make peace with an unavoidable UX fate or saddle up for a rooting joyride. Whatever your preferred path may be, there's a refreshing lack of bloat on the handset. So, apart from Facebook and the Dropbox integration (still 25GB for two years) ushered in with the One line, you won't find much to complain about. Update: We've uploaded a video and additional sample shots to the gallery above. It's clear that the EVO 4G LTE camera delivers. As expected, it takes lovely pictures with the same impressive low-light performance, striking colors and balanced exposure as the One X and One S. The features are identical too, with HDR and panorama modes plus a full set of real-time Instagram-like filters to chose from. The shooter is not without faults, however -- the autofocus often struggles in the dark and with close-ups of moving subjects, the white balance is sometimes off, and the settings still lacks a metering option (center-weighted, spot or average). While we applaud that the dual-detent shutter button locks both focus and exposure, there's no feedback from the UI when the camera is focused (such as a beep or a visual indicator in the viewfinder). Video recording on the EVO 4G LTE is just as refined as on the One X and One S, delivering silky smooth, 1080p content at 30fps with stereo audio and continuous autofocus. Slow-motion capture carries over as well. In light of the short amount of time we've spent with the handset and the similarities with its cousins, we're re-posting our existing samples. Stay tuned for additional images in the very near future. Let's not mince words here -- the EVO 4G LTE is a great phone in search of a network. Yes, it's thin, light, beautifully made and amazingly fast, with a gorgeous screen and a remarkable camera. 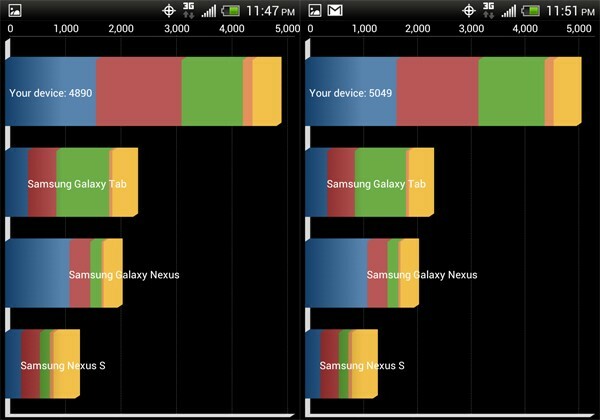 Sense 4 enhances Ice Cream Sandwich without diluting the user experience. As such, it absolutely lives up to its EVO namesake. In fact, we dare say that it's the best Android smartphone you can get on the network. While it does not match the One X's incredibly polished design, it improves upon its cousin with a kickstand, a dedicated camera key and a microSD card slot. Still, the lack of GSM/EDGE/HSPA+ world functionality is bothersome on such a high-end device, and the sealed SIM is just downright egregious. So, is the EVO 4G LTE worth its $200 price tag with a two-year commitment? The answer is simple: until Sprint's LTE network becomes widespread, it's hard to recommend any handset stuck on the company's lackluster EVDO network -- unlimited data or not. As soon as the device can live up to its acronyms, however, we'll be much more apt to give it our seal of approval. Brad Molen, Joseph Volpe, Myriam Joire and Terrence O'Brien contributed to this review.